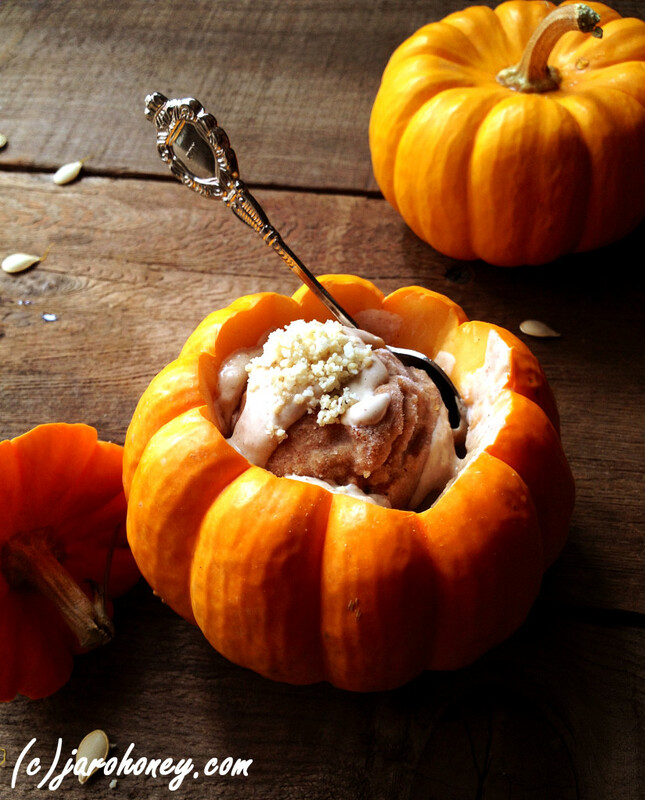 A raw organic pumpkin pie replacement for Thanksgiving- This one is a raw sorbet! Just about everybody loves a homemade pumpkin pie, but did you know that there are many ways to enjoy pumpkin in its raw form? Pumpkin pie can have some health benefits if made from real pumpkins, but the traditional crusts are often made from high-sugar and GMO ingredients. If you’re looking for a better (and raw) alternative health-wise, check out this recipe from the website JaroHoney.com. The main ingredient in this recipe is the Rawmio Hazelnut Silk product, a delicious raw sauce made from raw coconut, hazelnuts, coconut sugar, vanilla bean powder, cacao and Himalayan pink salt, which can be found by clicking here. In a food processor, fine grind the coconut and cashews. Add the water and blend well, this is your topping. Wash and dry the gourds. Cut these like a Jack O’Lantern– Use a small sharp knife and cut around the stem part out to about 1 inch from the edge at a slight angle go in towards the stem. Remove the top and reserve. Use a small spoon and remove the seeds and web inside the gourd. Gently scrape the inside of the gourd to clean out any remaining webbing or seeds. Rinse well and dry. Place each cleaned gourd and its top on a serving plate. Now in each stack 2 scoops of sorbet (see below for recipe) inside the gourd on top of each other. Evenly drizzle the sauce on each, evenly sprinkle the topping on each and serve. Cut your dates in half and place in a small bowl. Cover with 1/2 cup water and set aside. In a food processor, fine chop the pumpkin meat 1 cup at a time with about 3 tbsp. water. Place on the solid tray of your dehydrator. Spread out into a thin layer. Dehydrate for 3 hours, stir after 1 hour. In a small sauce pan on low heat, bring the coconut milk to 100 degrees F(use a calibrated thermometer), stir often. Now continue to reduce the coconut milk down to 1 3/4 cup (about 1 1/2 hours). Remove from the heat and set aside. Take all the pits out of the dates, reserve the dates and liquid, discard the pits. In your blender add the prepared pumpkin meat, reduced coconut milk, soaked dates and soaking liquid, pink salt, coconut oil and Rawmio spread- blend until creamy and smooth on high. Place this mixture in your ice cream maker and complete its cycle. Use a small (it looks like 1/2 the size of a regular traditional scoop) ice cream scoop and scoop out 24 scoops of sorbet. Lay on a flat tray on parchment paper and freeze for 2 hours. Remove from the tray and place in a sealed container back in the freezer and freeze overnight. Before you are ready to serve, allow to rest at room temperature for 10 minutes. -In a small sauce pan on low heat, bring the coconut milk to 100 degrees F (use a calibrated thermometer), stir often. Now continue to reduce the coconut milk down to 1/2 cup (about 1 hour). Remove from the heat and set aside. In your blender, add the cashews, fine chop on high. Now add the coconut milk and blend on high for 1 minute until smooth. Now add in the warmed Rawmio spread and blend on high for 1 minute. Serve. This recipe is a bit more complicated than the ones we’ve had in the past, but that makes it ideal for an awesome raw addition to your Thanksgiving dinner! Tags: pumpkin sorbet recipe, raw pumpkin recipe, raw pumpkin thanksgiving, raw pumpkin thanksgiving recipe, rawmio hazelnut, rawmio hazelnut sauce, and thanksgiving pumpkin recipe.